Is Glow Galaxy open to the public during parties? Glow Galaxy is only open for walk in play during scheduled Open Play times. All other times require a reservation (party or event). During parties, we have a max of two parties in our play area. Parties are matched up by the age of the birthday kids so that there is not too big an age gap between groups. Are the age requirements to play at Glow Galaxy? Children must be 2 to play on inflatables, we do not charge for children under 2 or count them as party guests. There is not an upper age limit, although inflatables have a 225 lb per person weight limit. What items are in Glow Galaxy's goody bags? Are adults counted as party guests? It is Ok to bring your own cake or ice cream cups for the party, but we do not allow other food or drinks to be brought into Glow Galaxy. Drinks for kids are included with every party package. In addition to the children's drinks we provide chilled water with every party; adult drinks can be purchased for $.90 for a can of soda or $.75 for a water bottle. 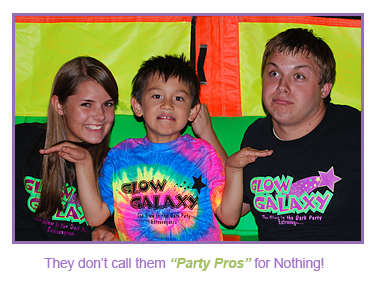 Glow Galaxy does not have set hours; most of our times are set aside for parties or large private groups. We do accept reservations for parties/events seven days a week. We also post Open Play times, when applicable on the website under "Open Play". Please note that some search results shows hours such as "Open today 9:00AM to 5:00 PM", but those hours did not come from Glow Galaxy and are not correct. Is the deposit for a party additional to the cost of the party? No, any deposit paid for a party is deducted from the cost of the party. So for a typical party, the balance due at the party will be the party cost plus sales tax, minus the $75 deposit. Deposit is non-refundable. If booked more than 2 weeks in adavnce of the party date, deposit is refundable for 24 hours after booking. There are a few ways to book a party: Online - click on the flashing icon that says "click here to book a party" in the upper right corner of any page or follow the link on the "Request a Date" page; Over the phone - call us at 770-368-3006; In person - you can also come in to Glow Galaxy to make a reservation, but you should ALWAYS call ahead to make sure someone will be at Glow Galaxy, unless you are coming during a posted Open Play time. Can I setup the party room prior to the party? In most cases, the party room is not available for setup prior to the party. Two hour parties consist of 75 minutes in the play area, which comes first, followed 45 minutes in the party room. We provide a cart for any items to go the party room. We have staff who clean and setup the party room between parties. They can set the room up for you or come get you at approximately 15 minutes before your party goes into the party room for party room setup.